Head Start For Pirate101 Begins! #Pirate101 – Nomadic Gamers, eh! The head start for Pirate101 has begun, if you’ve purchased one of their starter plans or set yourself up for a subscription you’ll be able to log into the game and play – the rest will be able to get into game when it fully releases on October 15th. 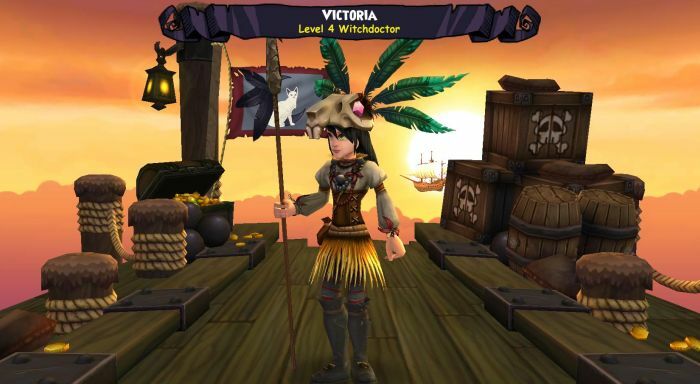 I played a swashbuckler in beta but wasn’t enthralled with the class, so this time around I picked a witchdoctor. I’ve only just started to make my way through the story and battles, but it’s a lot of fun. One thing that is NOT fun are players who go afk in the middle of a game or in the middle of a path of mobs and then you join in their game. Pirate101 (much like Wizard101) adds mobs based on how many ‘players’ are on the board at once, for a max of 4 ‘real’ players. That means if someone isn’t pulling their weight with encounters, you can be taking the brunt of most attacks. I had this situation happen for the first time this morning, a player decided to just sit in the middle of the very first place you happen to come across mobs. I stuck to the roads on either side after that, avoiding the first encounter and making my way to the second one. I’ve already found a few pieces of upgraded gear and browsed through the ‘crown’ store. It seems more expensive than I am used to (compared to Wizard101), over 1,000 crowns for a single piece of gear, like shoes. Still, the combat is fun and playing as a strategy game instead of just pure hack and slash combat really appeals to me. Plus there’s boats, and boat combat. You really can’t go wrong with that! I’m looking forward to posting more about my experiences as time goes on, if you happen to be playing and want to add me to your friends list you can contact me on Raptr (as Stargrace) and then IM me a ‘true friend’ code, they’re good for 48h each which should be plenty of time to log in.